Vilnius Grand Resort is a luxury country estate set within magnificent sprawling forest and lake scenery. Its peaceful location provides a carefree getaway while remaining just 20 minutes from the buzz of central Vilnius. The Resort boasts 185 well-appointed rooms and suites, a championship golf course The V Golf Club, a renowned spa centre and is the largest venue for events, meetings, weddings and celebrations in Lithuania. Room rate includes: breakfast buffet, all day access to the spa center and parking place. Visit Vilnius Grand Resort website. Hotel L’Ermitage features perfect location directly alongside of the Old Town of Tallinn. The hotel has modern architecture and contemporary furnishings, elaborated to details. Because of the beautiful interior decoration and its romantic name, Hotel L’Ermitage is sometimes also called a palace or a castle. At the hotel, there are 122 comfortable rooms, attentive and personal servicing waiting for you.Moreover, a private sauna and jacuzzi is available for a real relaxation. A complimentary buffet breakfast is served in the modern Cafe Katze and also classically furnished restaurant L’Ermitage. At the lobby bar, guests can relax by the fire and enjoy a drink. Visit L`Ermitage hotel website. 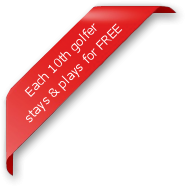 Each tenth golfer has chance to play golf and stay at hotel absolutely free of charge! Pay attention to our special offers, prepared in cooperation with European golf clubs and hotels. Golf groups are welcome!!! Euro Golf Advisor provides advises about golf resorts, golf clubs, hotels and golf tours in Europe. Our services include much more than just golf - we offer complete package with all information you need for planning memorable golf holidays. Have you ever played golf in the Baltic States? Then it the right time to experience memorable golf holidays in Latvia, Lithuania or Estonia. We can offer totally flexible golf packages, including detailed information about your chosen golf clubs, hotel and location.